The water inlet valve assembly controls and distributes water to different dispensers in your Maytag washer. But if the body cracks, water can leak throughout the machine. Over time, the solenoids can also fail and won’t distribute water correctly. You can replace this part yourself. Order replacement part #W10364988 for most Maytag washer models and follow these steps to install it. 1. Unplug the washer and turn off the water supplies. First, unplug the washer. This should be the first thing you do before starting any appliance repair procedure. Then turn off the local hot and cold water supplies. During this repair, you may need to pull the washer away from the wall so you can more easily access the rear of the appliance. If you want that extra space, disconnect the drain hose from the washer or pull it out of the wall connection so it doesn’t get stretched. Throughout the repair, you will need to have a towel ready to lay down under some of the water hoses. Every time you disconnect a water line or hose, there may still be water inside of it. 2. Disassemble the machine to access the water inlet valve assembly under the console. 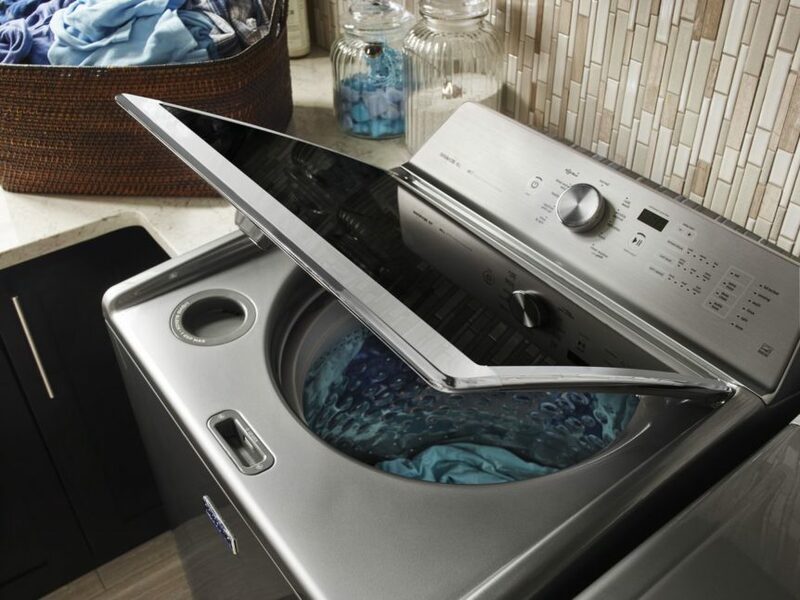 First, you will need to flip the top panel of the washer over. To start, tape the lid down securely. Next, depress the two tabs between the top panel and body of the machine. Pry a putty knife about six inches inward from each front corner to press each tab. Once both are open, swing the door up. Secure it with a belt so it doesn’t rest on the hinges or against the back wall. After that, remove the hoses from the water valves on the underside of the raised top panel. Locate the black hose connections in the bottom right corner of the lifted top panel. Take a picture of the hose lengths for a picture guide of which hoses will go where during reassembly. Each hose is clamped in place. Use pliers to compress and loosen the clamp. Then slide the clamp away from the hose head and remove each hose head from the ports. Gently lay down the top panel without fully shutting it and move to the back of the machine. Next, remove the fill hose lines that connect to the hot and cold water supplies. Loosen each hose with a wrench and then remove them by hand. After that, loosen the three screws along the back panel — which are level with the hot and cold inlets — to detach the console panel. Tilt the console open so the back lifts up and rotates so the console rests on top of the washer. Then locate the blue water inlet assembly on the right side. 3. Remove the water inlet valve assembly. Start removing the wiring harness. To do that, move to the left side of the console and cut the zip tie holding the left bunch of wires. Locate the thermistor that’s plugged into one of the plugs facing the back of the machine. It has two blue wires. Pry it out of the plug and start releasing the length of the wire to loosen it from the retaining clips holding the length in place. You may need to use a flathead screwdriver to pry the wire out of each tab without damaging either the wires or the plastic tabs. The wiring goes all the way to the right side of the gray wiring box. Once you’ve reached the right side, detach the two wide wire harnesses that slot into the right side of the box by depressing the mounting tabs on each one. Also, remove the three raised wire harnesses connected to the blue water inlet assembly. Locate the power cord in the cutout that faces the back of the machine. Don’t unplug it. Just pull it up from the cutout and set it to the left out of the way. Locate the three black circular mounting tabs on the internal side of the water inlet assembly. Pull them out of their positions. Also, loosen the screws that secure the water valves in place. There are two: one in-between the two water inlet ports and one in the corner by the red plug. Then carefully work the assembly up and out of its position by wiggling it as you lift it. If you feel resistance, make sure none of the wires or mounting tabs have gotten caught in the way. 4. Replace the water inlet valve. Orient the new part with the solenoids on the top and the water connections on the bottom. line it up with the holes and press it firmly into position. Secure it with the two screws you removed earlier. Reposition the power cord. Slide the length of the wire over the over the center of the water inlet assembly and press the black mount into the hole. Then slide the black box on the wire into the cutout so the power cord is in its original position. 5. Install the new wire harness. Orient it so the blue thermistor wires are over the gray wiring box and the other half of the wiring harness is over the blue water inlet assembly. Lay it loosely on top so you can start installing the different elements of it. Start with the blue thermistor wires. Insert the wires into each of the mounting tabs along the length of the wire box. Use a flathead screwdriver to carefully open the tabs and push the wires into place. Lace the end of it under the other wire harness and add a new zip tie to attach the one thermistor wire to the other bunch of wires. Then plug in the thermistor wires. Plug the two wide wire harnesses into the interior side of the gray wiring box. The shorter of the two harnesses goes into the socket closest to the rear of the washer and the other goes into the socket closer to the front of the washer. Next, plug the white wire harness onto the hot water solenoid and the purple wire harness onto the cold water solenoid. After that, there are four remaining raised solenoids. Locate the one closest to the back, left-hand corner. Moving in a clockwise direction, attach the wire harnesses with the (i) purple, (ii) red, (iii) yellow, and (iv) white. Once the raised solenoids each have the correct wire harness, attach the other end of the thermistor wires to the small plug between the solenoids with the cold water and yellow wiring. Line up the five mounting tabs at the interior edge of the console with the body of the washer. Then flip the console over and click the three back tabs with the screws into place. Tighten the screws to secure the console. Reattach the fill hoses. Make sure the two hoses are each attached to the correct port, with hot water on the left (facing the rear) and the cold on the right. Carefully lift up the lid and make sure it’s still secure by the belt. Reattach the four hoses to the new water valves. Use the picture you took previous to attach each of the hoses to the correct place. Press the hose heads over each valve and tighten the clamp in place over it. Lower the machine top. First, remove the belt and then carefully swing it down until it rests on top of the machine. Make sure the corner holes near the lid line up with the bolts on top of the washer. Once it’s down and in place. press it firmly down until you hear the locks engage. Reattach the hot and cold water hoses supplies and reattach the drain hose if you disconnected them at the beginning of the repair. Push the washer back into place against the wall and plug it in. 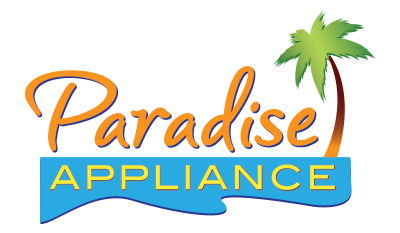 Go to Paradise Appliance Service here to find more appliance repair guides and help from trained technicians.